“Plastic is the main culprit. It has been destroying our environment. 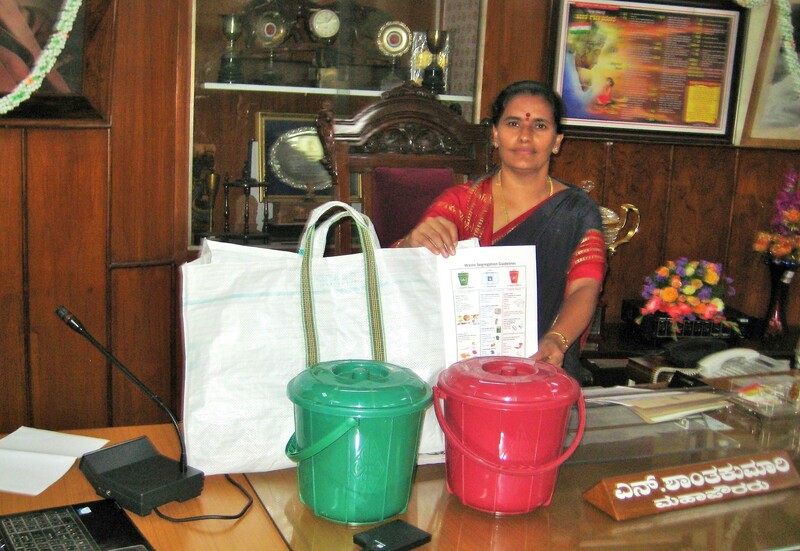 I have written a letter to the Chief Minister to ban the usage of plastic bags,” said Mayor Shanthakumari. Appreciating the 2b1b campaign kicked off by citizen groups Solid Waste Management Round Table (SWMRT) and Kasamuktha Bellandur (KMB), Shanthakumari says colour-coding makes the job easy for citizens. About ‘2b1b’: It means “two bins, one bag”. Green bin is for compostable kitchen/wet waste, red bin is for bio-medical/sanitary waste and the bag is for recyclables like paper, plastic, metal and glass which have to be handed over to pourakarmikas. 2b1b: Push the button. Say no to landfills. To order 2b1b online, click here. This entry was posted in Endlessly Green and tagged 2 bin - 1 bag campaign, 2b1b campaign, Kasamuktha Bellandur, KMB, Mayor Shanthakumari, plastic bags, Shanthakumari, Solid Waste Management Round Table, SWMRT. Bookmark the permalink.